Aims: The aim of the study was to check the antimicrobial activity of the 5% Sodium hypochlorite, 2% Chlorhexidine, 0.10% Octenidine (OCT), and 2% Silver Zeolite (SZ) at different time intervals against a single species biofilm of Enterococcus faecalis, Staphylococcus aureus, and Candida albicans model prepared on a nitrocellulose membrane. Settings and Design: In vitro nitrocellulose biofilm model was used to check antibacterial efficacy of root canal irrigants. Materials and Methods: The in vitro nitrocellulose biofilm model was used to check the antibacterial activity of root canal irrigants. Single species biofilms were suspended into 96-well microtiter plate and treated with root canal irrigants for 1, 5, 10, 15, 30, and 60 s, respectively. The remaining microbial load in the form of colony-forming unit/ml after antimicrobial treatment was tabulated and data were statistically analyzed. Statistical Analysis: SPSS version 17, Kruskal–Wallis ANOVA, Mann–Whitney U-test, and Wilcoxon matched pair test (P < 0.05) were used. Results: All tested microorganisms were eliminated within 30 s by all the antimicrobial substances tested except normal saline. 2% chlorhexidine and 0.10% OCT were equally effective against C. albicans at 30 s. Conclusion: The newly tested irrigants have shown considerable antibacterial activity against selected single species biofilm. OCT (0.10%) can be used as an alternative endodontic irrigant. Context: A novel root-filling material based on the incorporation of ultrafine alkaline bioactive glass particles (bioactive gutta-percha, [BGP]) was developed to work without sealer. Aim: In the present study, the objective was to verify the in vitro biological response to this material by assessing its cytocompatibility. Materials and Methods: Prototypes of BGP were compared to conventional gutta-percha (GP), dense polystyrene beads as a negative control and fragments of latex as a positive control. 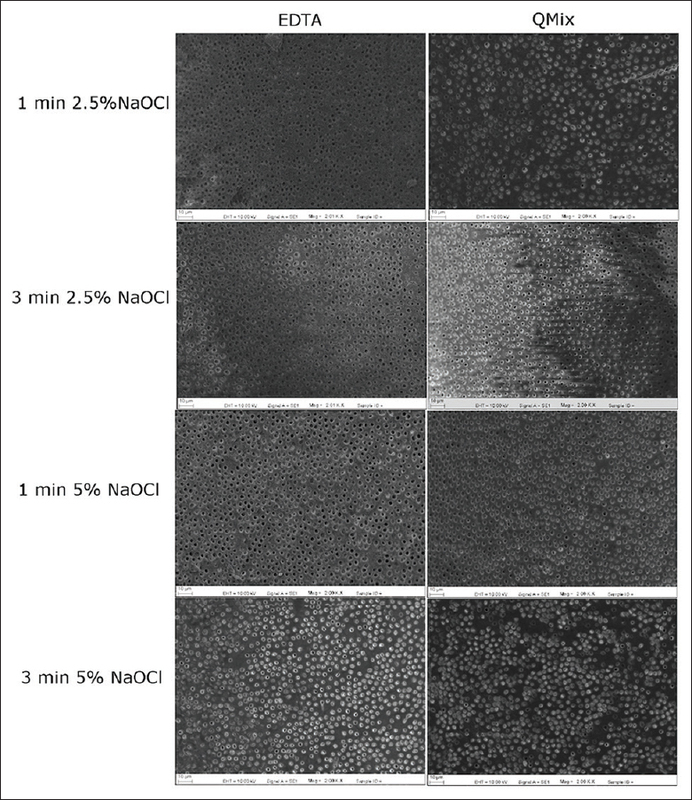 Extracts of each material were prepared according to ISO 10993-5:2009, and human osteoblast-like cells in primary culture were exposed to all extracts for 24 h. Cell viability was assayed sequentially for three different parameters: mitochondrial activity, membrane integrity, and cell density. Statistical Analysis Used: Nonparametric analysis (using Kruskal–Wallis test combined with post hoc Dunn's test) was performed for comparison among groups, with significance established at 5%. Results: BGP reduced mitochondrial activity to 62% of control, but presented no toxicity on membrane integrity and proliferation assays. 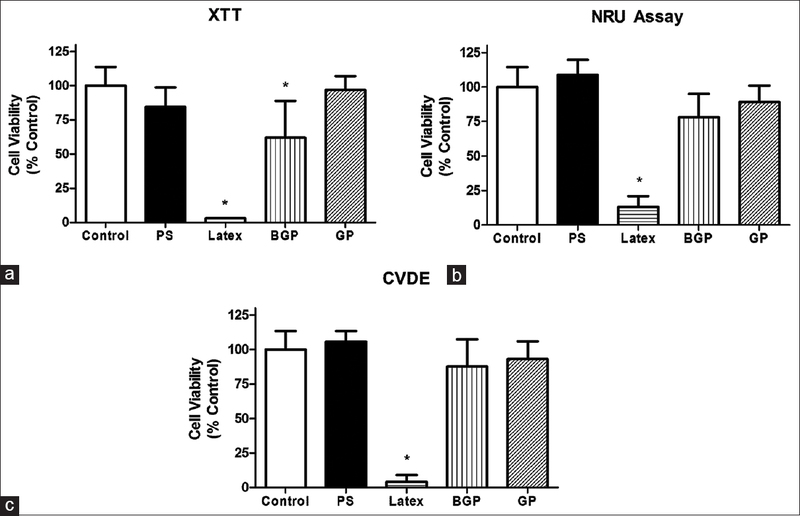 BGP effect on metabolism was dose-dependent and reduced to acceptable levels with dilution. Conclusion: The novel GP material presented slight dose-dependent effects on cell metabolism but did not affect cell survival. Aim: To evaluate the bond strength of different adhesives after contamination with saliva and blood at various steps of application. Materials and Methods: Buccal surfaces of 180 human premolars were sliced to expose dentin. The specimens were randomly divided into six groups (n = 30), in which saliva and blood were used as contaminants in three groups each. The groups were further divided according to the generation (fifth – OptiBond Solo Plus Kerr, USA; seventh – OptiBond All-In-One Kerr, USA; eighth – Futurabond DC, Voco, Germany) of the adhesive used. Effect of contaminant application both before and after polymerization of the adhesive was evaluated. Composite cylinders were fabricated on exposed dentinal surfaces and were subjected to shear bond strength test. The results were subjected to one-way analysis of variance and t-test. Results: The eighth-generation adhesive showed the highest mean shear bond strength, followed by fifth- and seventh-generation adhesive. Salivary contamination resulted in greater decrease of bond strength when contaminated before polymerization. However, the results were vice versa when blood contamination was done, except in the case of fifth-generation adhesive. Blood contamination produced the lowest shear bond strength in all conditions. Conclusion: The eighth-generation adhesives showed the highest and blood contamination the lowest bond strength in all conditions. Aim: The aim of the present study was to compare the canal transportation and centering ability of three rotary nickel-titanium (NiTi) systems (Twisted Files [TF], HyFlex controlled memory [CM], and Wave One [WO]) in curved root canals using computed tomography (CT). Materials and Methods: Sixty freshly extracted single-rooted teeth having curved root canals with at least 25–35 degrees of curvature were selected. The teeth were randomly divided into three experimental groups of twenty each. After preparation with TF, HyFlex CM, and WO, all teeth were scanned using CT to determine the root canal shape. 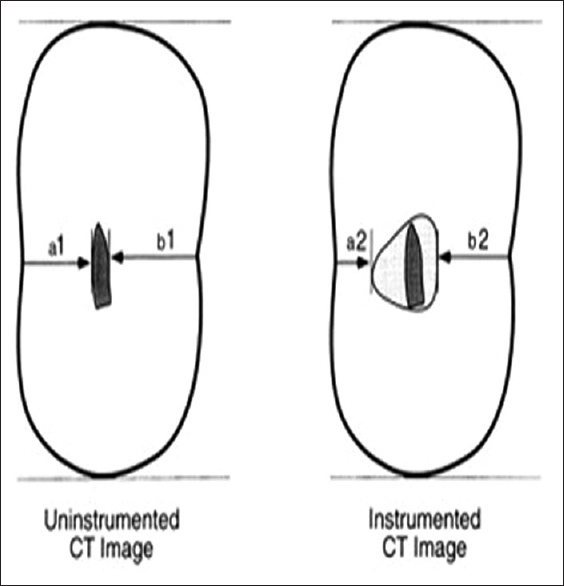 Pre- and post-instrumentation images were obtained at three levels, 3 mm apical, 9 mm middle, and 15 mm coronal above the apical foramen were compared using CT software. Amount of transportation and centering ability were assessed. The three groups were statistically compared with analysis of variance and post hoc Tukey's honestly significant difference test. Results: Least apical transportation and higher centering ability were seen in HyFlex CM file system in all the three sections followed by TF. WO file system showed maximum transportation. Conclusions: The canal preparation with HyFlex CM file system showed lesser transportation and better centering ability than TF, WO file system. Introduction: Conventional Class II cavity preparations used for restoring small lesions with amalgam may be inappropriate for composite resin restorations due to the extensive cavity form, large occlusal contact area, and thin or missing margins of the tooth. Cavity preparation in the proximal areas as per the precepts of Clark is a conservative method of caries excavation and tooth preparation. Materials and Methods: Conventional Class II and Clark's Class II cavities were prepared on the mesial surfaces of 60 molars. All cavities were given a standard buccolingual width of 2 mm, an occlusogingival height of approximately 3.5 mm and an axial depth of 1.5 mm. These were then restored using flowable composites or resin-modified glass-ionomer cement liners and nanohybrid composites. The compressive bond strength was tested with a universal testing machine. Results: The compressive bond strength was the highest for Clarks Class II cavity preparation with a lining of flowable composites. Conventional Box only Class II cavities restored with flowable liners showed the next best result. Conclusion: Clark's class II cavity preparation can be used as efficiently as the conventional Class II box preparation with the advantage of preserving more tooth structure, more precise tooth preparation, good bond strength and better esthetics. Objective: To evaluate the interference of active cellphones during electronic working length (EWL) determination of a root canal. 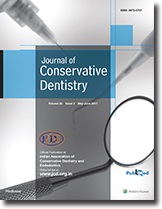 Materials and Methods: Thirty patients requiring root canal treatment in the anterior teeth or premolars having single canal and mature apices were selected for this study. Working length determination was done using no. 15 K-file. Electronic apex locators ProPex Pixi and Root ZX mini were used for working length determination. Cellphones iPhone 6s and Xolo Q3000 were evaluated for their interference. The experiment was conducted in a closed room (9 feet × 9 feet). Working length was measured with no cellphone in the room, iPhone 6s in a calling mode, Xolo Q3000 in a calling mode, and Xolo Q3000 and iPhone 6s simultaneously in a calling mode. Stability of the readings was also determined for every condition. Statistical Analysis: The data were statistically analyzed using one-way ANOVA and paired t-test at 0.05 level of significance. Results: Results were not statistically significant. Conclusion: Within the limitations of the present study, cellphones do not interfere with the EWL determination. Objective: The current study was intended to evaluate and compare the in vivo efficacy of Calotropis gigantea mouth rinse as anticariogenic agents with 0.2% chlorhexidine and Listerine mouth rinse. Materials and Methods: An experimental crossover study was conducted on sixty school children aged 14–15 years. 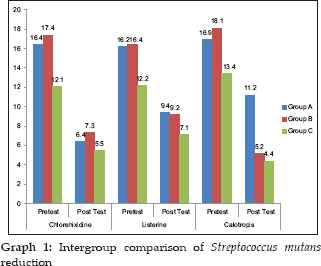 Participants were divided into three Groups A, B, and C. In all children, baseline unstimulated saliva samples were collected and assessed for Streptococcus mutans counts. The study was conducted in three phases; each phase lasted for 8 days separated by a washout period of 15 days in between them. Groups A, B, and C were treated with 0.2% chlorhexidine, Listerine and C. gigantea extract mouth rinses, respectively, in the Phase I and assessed for salivary S. mutans counts. Subsequently, mouth rinses were crossed over as dictated by the Latin square design in Phase II and III. Results and Conclusion: All the three mouth rinses have individually shown a statistically significant reduction in the salivary S. mutans counts. Aims: This study evaluated effect of infection control barriers on light intensity (LI) of light-curing unit (LCU) and microhardness of composite. Materials and Methods: Four different disposable barriers (n = 30) were tested against the control. LI for each barrier was measured with Lux meter. One hundred and fifty Teflon molds were equally divided into five groups of thirty each. Composite was filled in bulk in these molds and cured without and with barrier. 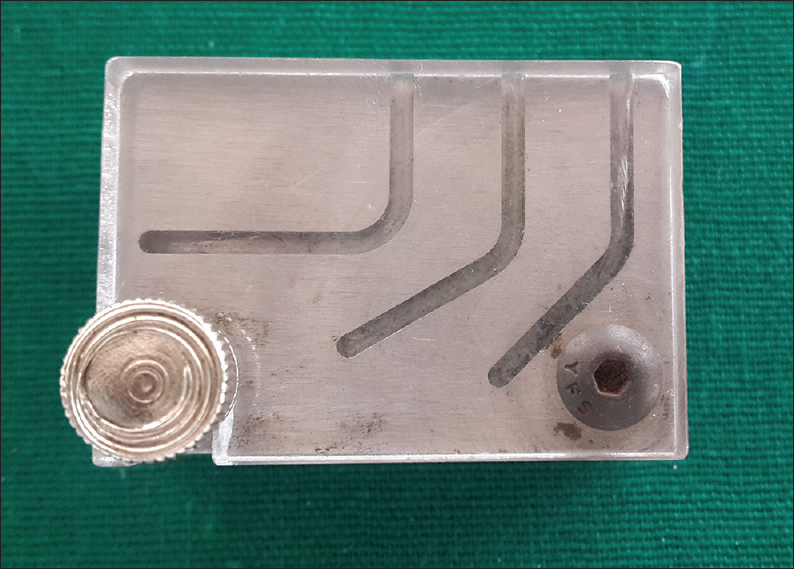 Microhardness was evaluated on top and bottom surface of composite specimen with microhardness testing machine and hardness ratio (HR) was derived. Statistical Analysis Used: One-way analysis of variance, Tukey's honestly significant difference test, and paired t-test using SPSS version 18 software. Results: All barriers had significantly reduced the baseline LI of LCU (P < 0.0001), but only Cure Elastic Steri-Shield and latex cut glove pieces (LCGP) significantly reduced the microhardness of the composite (P < 0.05). However, HR determined inadequate curing only with LCGP. Conclusions: Although entire tested barrier significantly reduced the LI; none, except LCGP markedly affected the degree of cure of the composite. Aims: The aim of this study was to compare the ability of 17% ethylenediaminetetraacetic acid (EDTA) and QMix with different concentrations and time exposures of initial sodium hypochlorite (NaOCl) to remove the smear layer from the root canals. Materials and Methods: Eighty maxillary central incisors were used. After instrumentation, the teeth were divided into eight experimental groups according to the initial and final rinse. About 2.5% and 5% NaOCl were used during instrumentation and for 1 or 3 min was used as postinstrumentation initial irrigants, and 17% EDTA and QMix used as final irrigants. The apical and middle parts of the specimens were observed by scanning electron microscope. Statistical Analysis Used: Data were analyzed using the Kruskal–Wallis, Mann–Whitney, and Friedman's test. Results: Regardless of the type of final irrigant, QMix allowed more smear layer removal than EDTA after using 5% initial NaOCl for 3 min. In the apical part of the root canal walls, the smear layer was not completely removed. Conclusion: QMix and EDTA were similarly effective in smear layer removal at the middle parts of the root canal regardless of the concentration and time exposure of initial NaOCl, while none of the irrigation protocols was able to remove smear layer at the apical parts. Aim: In-vitro study was done to evaluate the incidence of MB2 canals using three different methods (CBCT, CLINICAL ANALYSIS AND DENTAL LOUPES) and to compare the efficacy of the three methods in identifying the incidence of MB2 canals in maxillary permanent first molars. Materials and Methods: The study sample consisted of 120 extracted intact permanent maxillary molars. These extracted teeth were subjected to CBCT. Later the teeth were access opened with naked eye to find the incidence of MB2 canal, and then the teeth were visualised under dental loupe to locate MB2 canal if they were missed under naked eye. Results was statistically analysed by Mc Nemar's tests with Bonferroni correction, Chi square test and Cochran's Q test. Result: CBCT showed high incidence (68.3%) of MB2 canal in maxillary first molars and it showed to be a reliable method in detecting MB2 canal. When compared to dental loupe (52.5%) and naked eye (25%), the dental loupe improved the detection of MB2 canal. 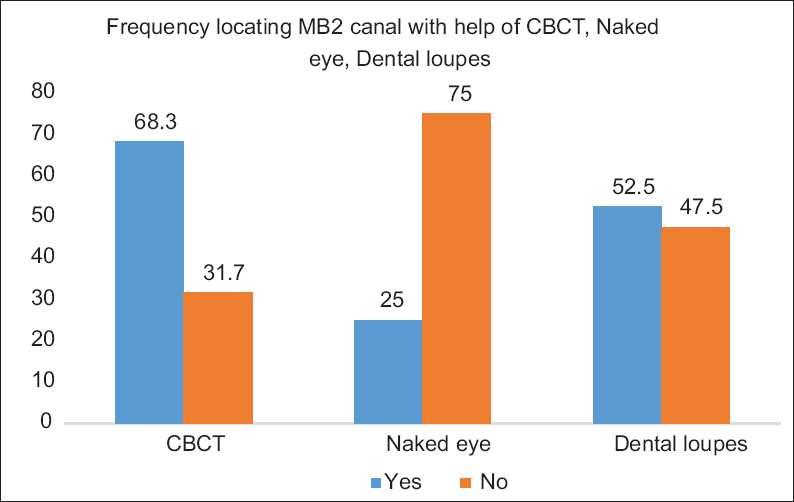 Conclusion: Within the parameter of this study in detecting the incidence of MB2 canal, using CBCT dental loupes and naked eye, detection of MB2 canal was significantly higher with CBCT followed by dental loupe and least with naked eye. Aim: The aim of this study is to assess the effect of sodium hypochlorite and sterilization on the cyclic fatigue resistance of two reciprocating nickel-titanium files using a rotary and a reciprocating motor. Materials and Methods: Totally, 160 Reciproc and Wave One files were tested. The eighty files of the same brand were assigned into four groups (n = 20). These four groups were further divided into two subgroups, 1a and 1b, 2a and 2b, 3a and 3b, 4a and 4b consisting of ten files in each group. 2.5% NaOCl for 5 min, 2.5% NaOCl for 5 min + 1 cycle of autoclave sterilization, 2.5% NaOCl for 5 min + 5 cycles of autoclave sterilization, no sterilization (control). Groups 1a, 2a, 3a, and 4a were subjected to 30° and Groups 1b, 2b, 3b, and 4b were subjected to 60° canal curvature. Results: Intergroup comparison reveals that there is an increase in cyclic fatigue resistance from the first cycle to the fifth cycle of autoclave which is statistically significant. Conclusion: Reciproc and Wave One showed reduced cyclic fatigue resistance on immersion in NaOCl for 5 min. Multiple autoclaving cycles significantly increased the cyclic fatigue resistance of Reciproc file system in both the curvatures. There was a decrease in cyclic fatigue resistance for Wave One after multiple autoclaving at 60° curvature which was statistically significant. Aim: The aim of this study was to quantitatively estimate the concentration of ion release from recasted base metal alloys in various pH conditions using atomic absorption spectroscopy (AAS). Materials and Methods: Specimens of commercially available dental casting alloys (cobalt [Co]-chromium [Cr] and nickel [Ni]- chromium [Cr]) were prepared using lost-wax casting techniques and were stored in the test solution for 1 week and 4 weeks, and ions released during chemical corrosion were detected using AAS. Results: An increase in the quantity of ion release was observed with recasting. These changes were higher after twice recasting in Ni-Cr alloy. Aim: The purpose of this study was to evaluate the clinical performance of Ketac Nano (Ketac™ N100), RMGIC (Fuji Filling™ LC), and Giomer (Beautifil® II) in noncarious cervical lesions (NCCLs). Materials and Methods: One operator restored 120 NCCLs in 20 subjects, with at least two lesions restored with one of the restorative materials: RMGIC (control group), Giomer and Ketac Nano (experimental groups). Two observers evaluated retention, marginal discoloration, marginal adaptation, color match, surface roughness, and postoperative sensitivity using modified USPHS criteria at baseline, 6, and 12 months. 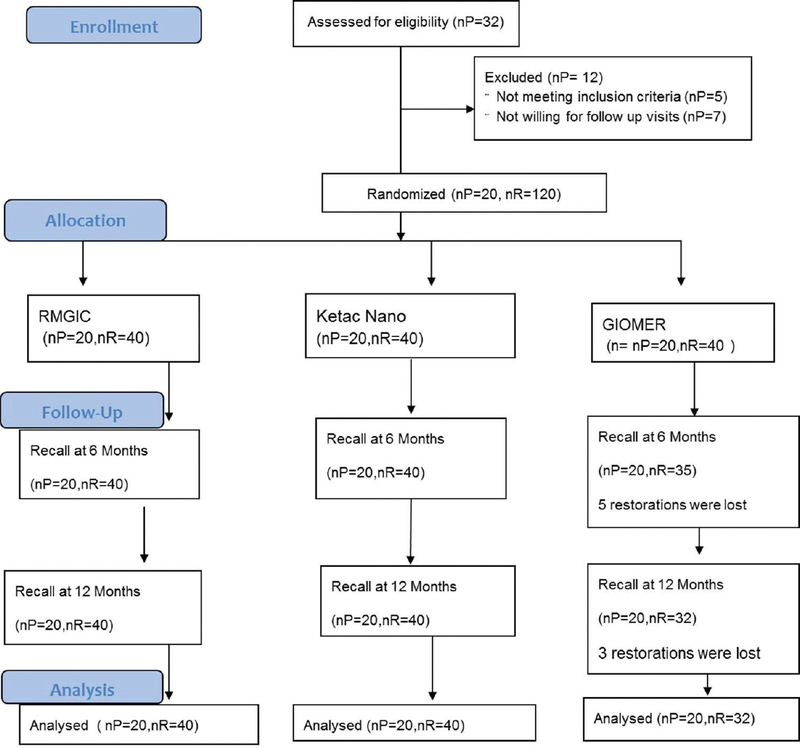 Study Design: Double-blinded randomized clinical trial (RCT). Statistical Analysis: Kruskal–Wallis test, Mann–Whitney U-test, Wilcoxon matched-pairs test. Results: There was statistically significant difference observed between Giomer, Ketac Nano and RMGIC after 12 months (P < 0.05). There was a significant decrease in retention rates for Giomer (P = 0.0050), increased marginal discoloration and color mismatch for Ketac Nano (P = 0.0025, P = 0.0053), increased surface roughness and color mismatch with RMGIC (P = 0.0022, P = 0.0077) from baseline to 12 months. Conclusion: Within the limitations of this RCT of 12 months, Ketac Nano and RMGIC restorations were better retained in NCCLs while superior color match and surface finish were observed with Giomer restorations. The most common discrepancy concerning tooth size is the presence of peg-shaped lateral incisors, which can cause teeth with reduced size, anterior diastema, and consequently an unpleasant smile. The development of the adhesive dentistry and ceramic veneers allowed all ceramic-bonded restorations to become an esthetic and functional approach to reestablish the smile harmony. 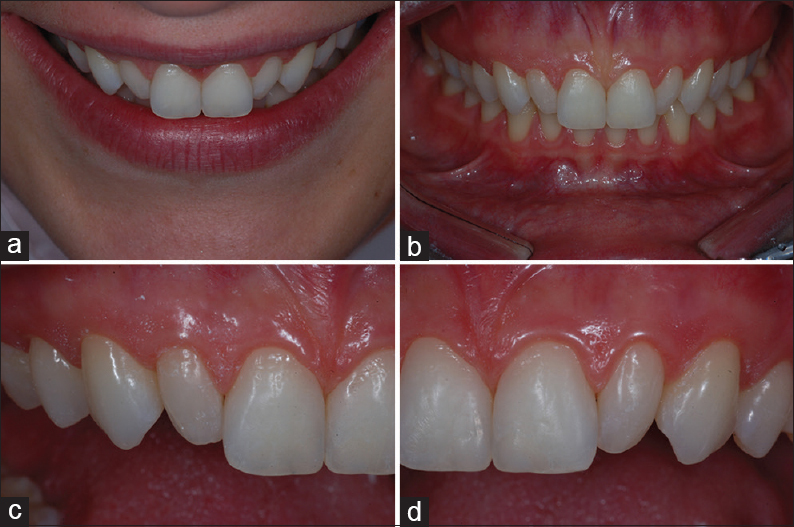 The purpose of this clinical report is to describe a conservative treatment approach to recover an esthetic disharmony caused by bilateral peg-shaped lateral incisors. 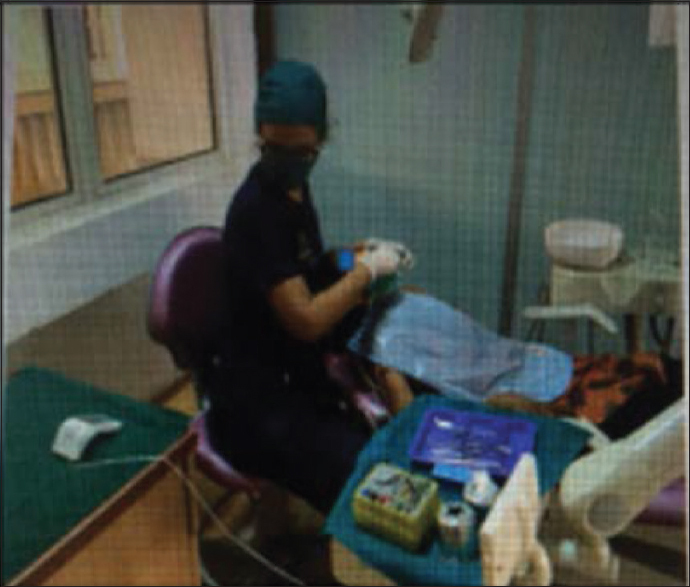 A 30-year-old female patient was seeking treatment to solve an esthetic disharmony of her smile. Lithium disilicate veneers were planned and build-up with the help of diagnostic models, wax-up, mock-up, and silicone guides, to restore the morphology, size, function, and esthetic of upper lateral incisors and smile. The lithium disilicate veneers were able to provide the harmonization of the patient's smile, recovering the teeth size, shape, and anatomic characteristics. Invasive cervical resorption (ICR) is an aggressive and invasive form of external tooth resorption that commences in the cervical region which can be managed using either a nonsurgical, surgical or a combination of nonsurgical and surgical approach. The restoration of resorptive defects having a coronal and radicular extent can be challenging as a single material cannot be used to restore the entire defect. This case presented with Heithersay's Class 3 ICR lesion in tooth #12, which was managed initially using a surgical approach and restoration of ICR defect with a combination of resin modified glass ionomer cement, composite resin and mineral trioxide aggregate (MTA). However, the patient presented with pulpal symptoms 2 months later which warranted a root canal therapy. An internal approach was then used to debride and remove remnant fibro-osseous tissue. The defect was then repaired with MTA. A 1 year follow-up demonstrated adequate periapical healing and no pathologic changes around the restored resorptive defect.